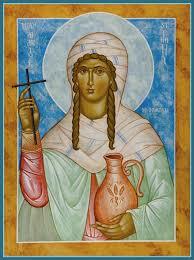 St. Photini (Samaritan Woman at the Well and called the First Evangelist and Equal to the Apostles) is the head of a prayer group for Holy Apostles Orthodox Christian Church. We currently have 13 people who have volunteered to pray our list on a regular basis. If you would like to be a Prayer Warrior and be a part of this group, please contact Kay Pappas. We pray for our Metropolitan Isaiah, Members of Holy Apostles Church, some of our Churches and Priests and their Families in our Denver Diocese and other Priests and Families, Visitors who come to Holy Apostles, Souls of the Departed, Victims of Disasters, those Pregnant, those who are recently Baptized or getting Married, Travelers, those who have Cancer, Prisoners, Widows/Widowers & Families, College Students and any prayer request from anyone for anyone. If you have a prayer request, please contact Kay Pappas at her e-mail: wycheygirl@gmail.com Also, we have a Prayer Request Box in the Narthex at the Church to receive prayer requests. May our merciful Lord hear our prayers through the intercessions of our Most Holy Mother of God, Holy Apostles and St. Photini!